Looking to Make a Delicious Tropical Smoothie? Do you love to experiment with adding exotic fruits in your smoothies? Want to learn to make a drink that will instantly take you away to your favorite tropical paradise? What is a tropical smoothie? Simple. It’s any smoothie that uses tropical fruits as a base. If you buy smoothies from places like Jamba Juice or Juice Stop, you are already familiar with these tropical drinks, and you most likely love them! I know I used to always go to Juice Stop and order anything with mango, pineapple or coconut. They were my favorite choices on the menu. But then I learned to make my own smoothies at home for much cheaper, and much healthier! 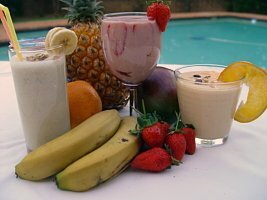 The recipes on this site are the results of many years of making my own smoothie recipes and testing them on myself, family and friends. I’ve shared only the best! So What Makes a Tropical Frozen Drink so Good? The natural sugar in fruits like mango, pineapple, papaya, coconut, and passionfruit makes the smoothies wonderfully tasty without all the health risks of artificial sweeteners or added sugar. Not to mention the incredible health benefits of these tropical fruits, delivering generous portions of the vitamins you need. Plus, there’s something about those fruit flavors that automatically makes me feel relaxed and takes me one step closer to paradise in my mind. And the great thing is, most of those fruits are readily available in your supermarket, so it’s easy to make these yummy recipes. One caveat: Not all of these are grown locally so it’s best to keep these tropical drinks an occasional treat, not an everyday staple. There’s a reason they’re called “exotic” fruits—they’re not from here. To make life easier, you can buy frozen tropical fruits from most supermarkets. I keep a stash of Trader Joe's frozen mangos and pineapples on hand to quickly toss in my smoothies. Do you already have a favorite tropical fruit on hand, and you want to find a quick smoothie recipe using that fruit? Maybe you have a sudden mango craving, or you bought a bunch of pineapples on sale and you don't know what to do with them. Don't have a particular fruit in mind? No problem...take a look at the list below for an expanded list of the tropical smoothie recipes on this site, including descriptions. Super-Easy Mango Smoothie Recipe - This free peach mango smoothie recipe is simple to make and absolutely delicious! Frozen Mojito Smoothie - Learn how to make the coolest frozen mojito! You’ll never believe that this super delicious tropical smoothie is actually a healthy green smoothie in disguise. Papaya Smoothie Recipe - Experience the incredible healing power of this delicious tropical fruit with this easy recipe. Pina Colada Smoothie - Love piña coladas? Discover how this pina colada smoothie recipe can actually put you on the path to good health...I'll toast to that!